Unless you have ever gotten gallstones, you probably haven’t given your gallbladder much thought. It’s an organ that helps with digestion by helping to store and release bile (that is created by the liver). As long as it’s working, you probably wouldn’t give it a second thought. But did you know that under certain conditions, you can develop something called gallbladder sludge? Gallbladder or biliary sludge can become an uncomfortable issue for some people. With that in mind, we present to you a guide to gallbladder sludge. From gallbladder sludge causes and symptoms, to gallbladder sludge treatment and gallbladder sludge home remedies, we’ll give you everything you need to know about the condition. Sludge in the gallbladder sounds like a gross and potentially painful situation. So, what does it mean for your health? Let’s examine sludge in the gallbladder causes as well as sludge in gallbladder symptoms. Unfortunately, there isn’t much in the way of symptoms of gallbladder sludge by itself, but it can cause a number of things with obvious symptoms. 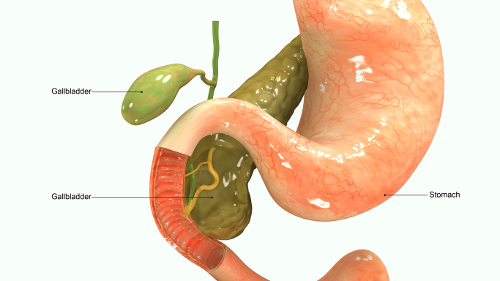 Gallbladder sludge can lead to the formation of full gallbladder stones and acute acalculous cholecystitis (the inflammation of the gallbladder). These issues can end up causing abdominal cramps, chest pain, nausea, and changes in bowel movements. With these types of complications, you might want to know how gallbladder sludge can be diagnosed and treated. While gallbladder sludge isn’t necessarily a cause for alarm on its own, the conditions that it can lead to are reason for concern. But, how does a doctor go about diagnosing gallbladder sludge, and how does the sludge in gallbladder treatment begin? Doctors can diagnose gallbladder sludge a few different ways. The most common way is with an abdominal ultrasound. It can also be detected with an endoscopic ultrasound. This form of diagnostic imaging may also pick up full-blown gallstones. In terms of treatments for gallbladder sludge, there isn’t much that can be done. For most people, the issue will work itself out—provided that patients deal with any accompanying health conditions. If the gallbladder sludge is troublesome, then it can be cleaned out via endoscopic retrograde cholangiopancreatography. If the issues are severe, the doctor may recommend having the gallbladder completely removed. But, there are some diet tricks that may help you prevent or loosen up the sludge in your system. While gallbladder sludge itself can be hard to deal with, you can make changes in your diet that may help you deal with the sludge and associated issues as a whole. As an added bonus, most of these diet tips are healthy tips for your diet anyway. Limiting your fat intake can help with gallbladder issues. Eat less foods high in bad fats (saturated and trans fat) such as butter, cheese, and fatty meats. Fried foods, in particular, should also be avoided. Omega-3 fatty acids, however, can help your gallbladder a great deal. Adding foods like fish and walnuts to your diet will boost your omega-3 intake. Researchers suspect that omega-3s help the gallbladder empty itself out, which can help prevent sludge for building up. Dramatic weight loss may lead to the formation of gallbladder sludge. Extreme “crash” diets often result in a sudden, severe loss of weight. Instead, go with more traditional diets that promote gradual weight loss. Adding more fiber to your diet may relieve gallbladder issues as it could help the organ empty itself. Fiber can also make you feel fuller than you are, which may lead to less snacking and eating and help with gradual weight loss. Unfortunately, there is no magic cure for gallbladder sludge. Following some of these tips for a gallbladder sludge diet may help you relieve the issues you may be having, and may even be helpful in preventing them from getting too bad in the first place. Gallbladder or biliary sludge can cause a number of issues for you. It can affect your gallbladder by causing inflammation and creating an environment that may result in gallstones. Unfortunately, there aren’t many warning signs of gallbladder sludge. By the time you know that it’s causing a problem, that problem has already appeared. But, by keeping your situation monitored and watching your diet, you might be able to empty out that sludge. You may also be able to stop related conditions before they start, or if they have occurred, before they get worse. Dr. Chris, “Gallbladder Sludge (Biliary) – Causes, Symptoms, Flush, Treatment,” Health Hype, http://www.healthhype.com/gallbladder-sludge-biliary-causes-symptoms-flush-treatment.html, last accessed April 13, 2017. Stresing, D., “Sludge in the Gallbladder,” Everyday Health, January 25, 2010, http://www.everydayhealth.com/gallbladder/sludge-in-the-gallbladder.aspx, last accessed April 13, 2017. Modric, J., “Gallbladder or Biliary Sludge,” eHealth Star, July 8, 2016, http://www.ehealthstar.com/conditions/biliary-sludge, last accessed April 13, 2017. “Gallbladder Sludge – Treatment, Symptoms, Removal, Diet, Causes,” Hub Pages, January 2, 2014, https://hubpages.com/health/Gallbladder-Sludge, last accessed April 13, 2017. Renee, J., “Foods to Avoid With Gallbladder Sludge Problems,” Live Strong, October 25, 2015, http://www.livestrong.com/article/509460-foods-to-avoid-with-gallbladder-sludge-problems/, last accessed April 13, 2017. Andrews, J.M., “Diet for Gallbladder Sludge,” Live Strong, April 26, 2015, http://www.livestrong.com/article/509460-foods-to-avoid-with-gallbladder-sludge-problems/, last accessed April 13, 2017.